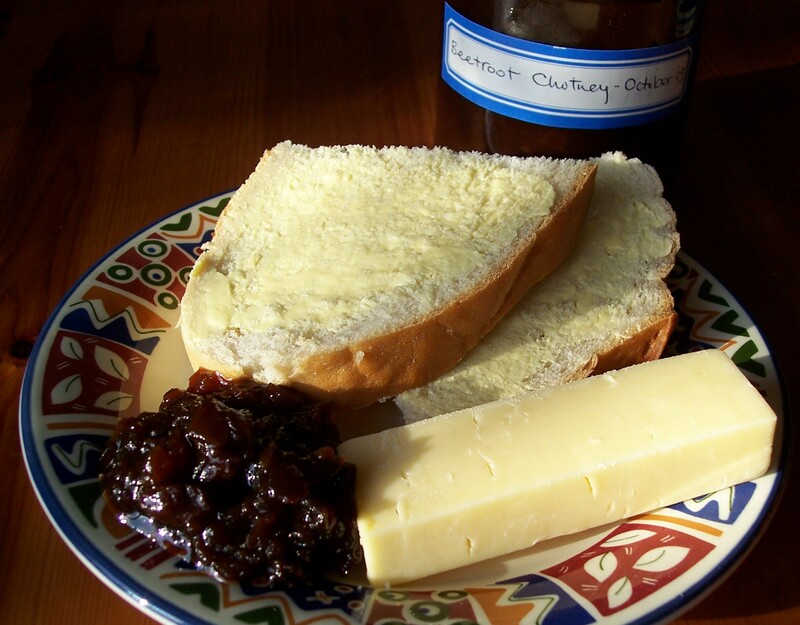 Regular readers of this site will know by now that we love a good chutney! My previous posts for Beetroot Chutney and Tomato Relish are two of the most visited and commented on recipes that I have posted – Spiced Damson Chutney has also proved popular (see comment below – thanks Sharon!). Here, I suspect is another favourite. Certainly, the half quantity I made was eagerly received and left me wondering why I had not risked making the full amount. However, I still have lots of apples to use up – what a bumper harvest (and generous friends) – we have had this year. 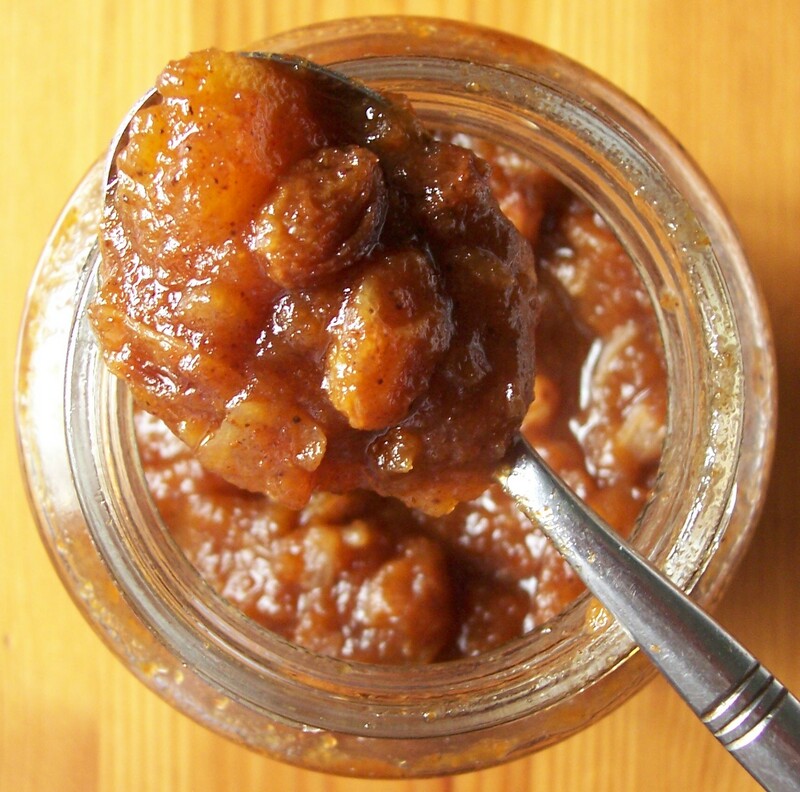 I was first alerted to the recipe for Spiced Apple Chutney by Shaheen at Allotment 2 Kitchen. That was way back last year at the end of November when I did not have enough time (and had also just made a shipping order of different chutneys). I made a note to have a go at making the original recipe for Spiced Apple Chutney which came from BBC Food as it looked so good. The amounts spice used looked rather a lot, especially the paprika, so I used scant quantities, but I think I need not have bothered. Shaheen used Allspice rather than Mixed Spice but I am not sure why as they are not the same: it may of course be a personal tweak adding a flavour she really liked – not uncommon! Allspice are berries from the Pimiento. Mixed Spice is a blend of ground spices especially used in the UK which usually includes Cinnamon (or Cassia), Nutmeg, Cloves and Ginger (occasionally Allspice, Cayenne and/or Coriander as well). It is similar to the French Quatre épices (literally four spices): pepper, cloves, nutmeg and ginger (sometimes substituting allspice for pepper and cinnamon for ginger), commonly used in meat dishes such as paté and terrines. Additionally in the Netherlands (Belgium and Germany too) the Speculaas/Speculoos biscuits contain a spice mixture called (in the Netherlands) Speculaaskruiden, which is a mixture of cinnamon, nutmeg, cloves, ginger, cardamon and white pepper. (I keep promising myself I will make some of these biscuits…) Although this is rather going off on a tangent, there is an interesting post listing Spice mixtures worldwide on Wikipedia. However, back to the chutney… I’m thinking of putting in ginger another time in addition to what is already in the mixed spice to enhance that flavour. 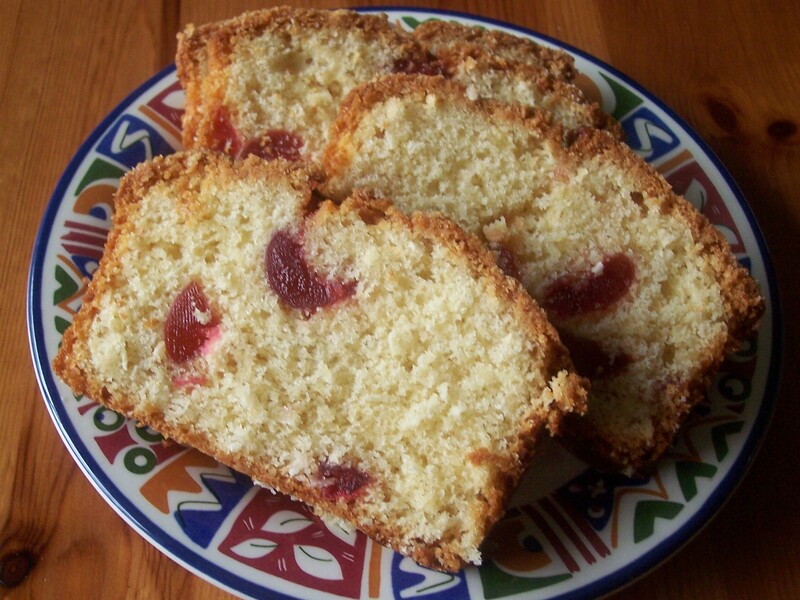 The original recipe gave a choice between adding sultanas or raisins (which are similar) and as an alternative, dates. There was never any contest for me as I would find dates just too much in what is already rather a sweet (though delicious) chutney: sultanas it was! The only other tweak I made was to use my usual method of adding the sugar later once the other ingredients have reduced a little. The sugar can be inclined to make the mixture burn before it has fully reduced and I find this helps to prevent this. 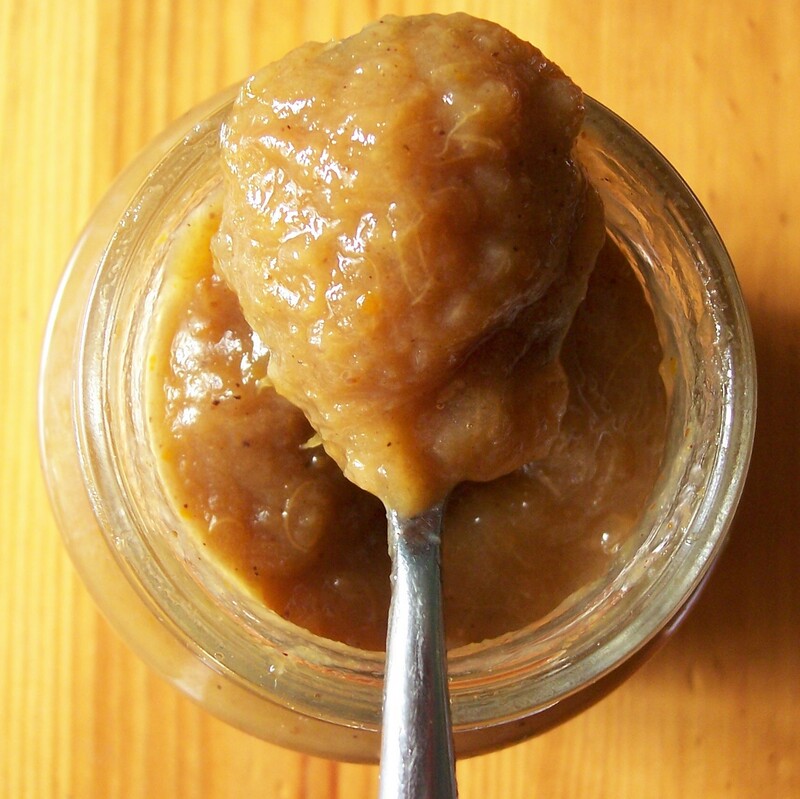 Overall I would recomment Spiced Apple Chutney as having a lovely mixture of sweet and spicy. It is delicious eaten with pungent cheese, ham or pork (but I am sure it would be a good accompaniment for all meats. 1. Put all the ingredients apart from the sugar into a saucepan. Slowly bring to the boil and simmer for 1 -1½ hours, stirring from time to time to stop the chutney sticking to the pan. 2. Reduce the mixture until it has thickened. You should be able to draw a channel across the bottom of the pan through the mixture that doesn’t close over too quickly. 3. Add the sugar and stir until dissolved. Continue to cook on a medium/high heat, stirring regularly to avoid burning. 4. Continue to cook until the chutney is very thick and you can once more draw a channel across the base of the pan that does not immediately fill with liquid. 5. Meanwhile wash the jars well and sterilise them. I usually do this by filling the jars with boiling water and putting the lids in a bowl of boiling water. I pour away the water just before filling each jar and immediately take the lid from the bowl and screw it on. 6. Pot while still hot into the pre-prepared sterilised jars. Screw on the lids well and then turn upside down until cool, which helps with the seal, after which they can be labelled. This can be eaten immediately but also keeps well. 8. This is particularly good eaten with cheese, ham or pork. I came across this recipe recently whilst leafing through one of my favourite chutney and pickle books The Penguin Book of Jams, Pickles & Chutneys by David & Rose Mabey and is extremely simple. The instructions say it goes well with ham and I plan to make sure it goes on the table at Christmas & New Year. I tried a quarter quantity using inexpensive supermarket Value brand prunes and was able to almost fill two attractive tall jam jars, just having to add a few extra prunes (say 50g) for good measure to top up the jars. 1. … if the prunes seem a little dry cover with boiling water. Leave for 5-10 minutes to plump up before draining well. 2. Wash the jars well and sterilise. I usually do this by filling the jars with boiling water and putting the lids in a bowl of boiling water. I pour away the water just before filling each jar and immediately take the lid from the bowl and screw it on. Shake as much water from them as possible before filling. 3. Place the sugar,vinegar and spices in a small pan. Boil for about 10 minutes to allow the sugar to dissolve and the flavours to permeate the vinegar. 4. 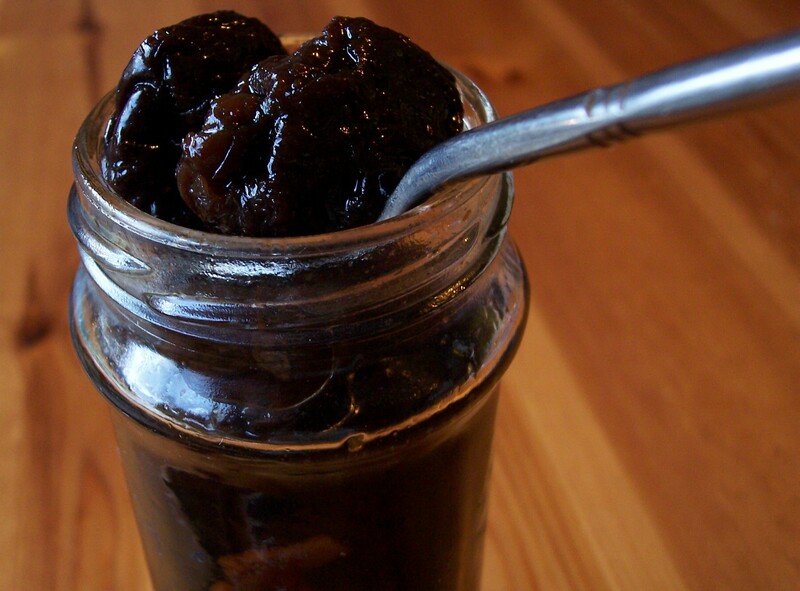 Pack the prunes into prepared jars, using extra prunes if necessary. 5. Adding brandy is optional and if using it should be divided equally between the jars before adding the vinegar mixture. 6. Place the peppercorns and mace blade in the jar (cut the blade into pieces if you have more than one jar) and finally pour the vinegar over the prunes. 7. Put the lids on the jars and invert until cool, which helps with the seal. 8. These prunes can be eaten immediately but are better kept a few weeks or even months. They have a spicy slightly sharp flavour and are good eaten with cold ham. I have been thinking ahead to Christmas cooking as some of the recipes need to be made in advance to allow the flavours to mature. I will make our Christmas cake, Christmas Pudding, Christmas Chutney and Mincemeat very soon but first here is the recipe for some delicious spiced pears. These are good served with cold meats or cheese at a festive seasonal buffet. The recipe comes from the Hairy Bikers BBC Christmas television series The Hairy Bikers Twelve Days of Christmas. They credit Italian chef Antonio Carluccio as their inspiration. I followed the original recipe for Pickled Pears almost exactly using 2lb jars (which had originally been full of Mincemeat). Kilner type preserving jars would be ideal if available. These pears should be eaten within two months and stored in the fridge once the jar is opened, so if you are unlikely to eat a large quantity in one go it could be a good idea to make smaller jars containing just one or two pears. Juniper Berries are becoming easier to find, though still not widely available in the UK. I have a small jar, bought from the herb and spice section of a French supermarket which is labelled Baies de Genièvre. The original recipe did not specify the size of pear, but I chose small evenly sized ones, digging into the bottom and removing the end opposite to the stalk. These are designed to be served whole on a buffet with slices cut from them by diners, but I wonder if pear quarters might be a good alternative to whole pears. I think too that peach or plum halves would be delicious prepared to the same recipe and even perhaps mixed in the same jar – something to try another year! 1. Place the water, vinegar, sugar, star anise, cinnamon stick, allspice berries, lemon zest, cloves and juniper berries in a large, lidded, non-reactive pan and bring to the boil. 2. Peel the pears carefully leaving the stalks intact. I like to gently dig out the end opposite the stalk. Add the pears to the saucepan and cover the pan with a lid. Reduce the heat and let the pears simmer gently for 10-15 minutes, or until they are tender. 3. Carefully remove the pears from the pan with a slotted spoon and set aside. 5. Wash the jars well and sterilise. I usually do this by filling the jars with boiling water and putting the lids in a bowl of boiling water. I pour away the water just before filling each jar and immediately take the lid from the bowl and screw it on. Shake as much water from them as possible before filling. 7. Seal the jars tightly. I find that inverting the hot jars, until they are cool, helps with the seal. 8. 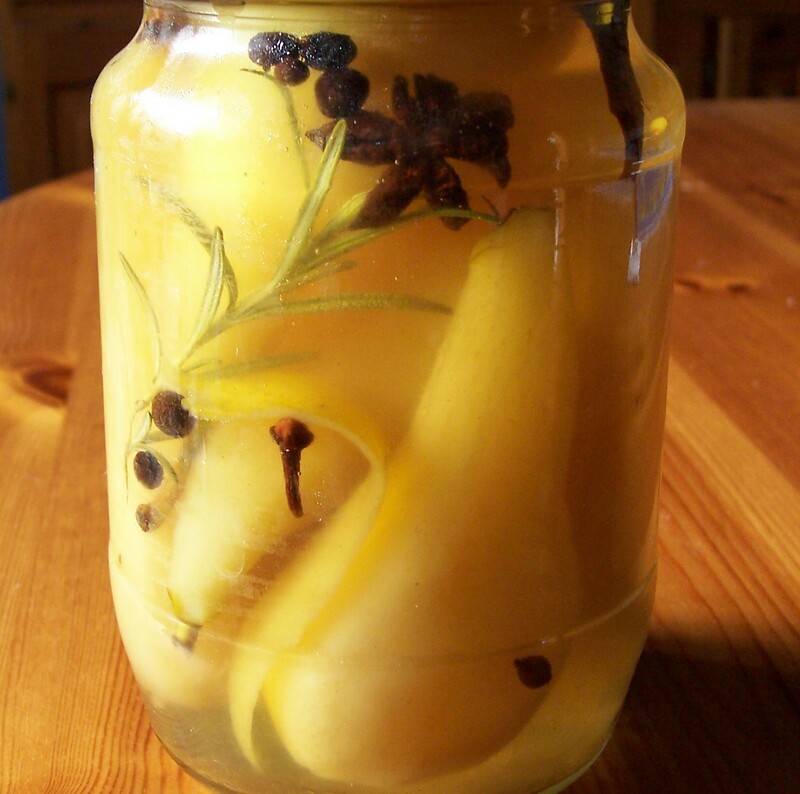 These pickled pears can be stored for up two months. They can be eaten after one week but once the jar is opened it should be stored in the fridge and eaten within two weeks. The English Lake District holds many happy childhood memories for me. Each summer we visited my grandparents who lived at Arnside on Morecambe Bay, in what was then called Westmorland (a county name that is sadly no longer used, being part of Cumbria since 1974). We had many day trips to the lakes and fells for picnics and walking. A few weeks ago I happened upon a daytime programme on Channel 4 called Lakes on a Plate, which promised good scenery with food and recipes. I am currently working my way through what turned out to be a series of about 20 half hour programmes. 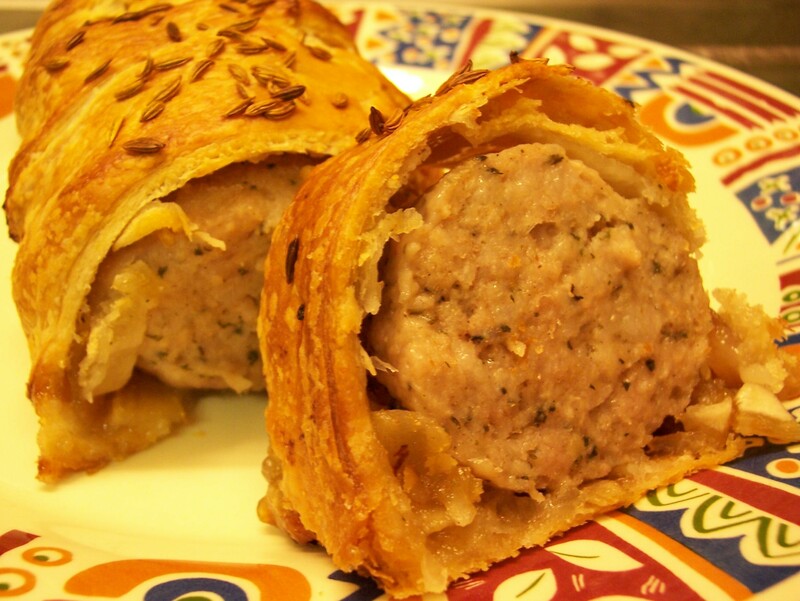 One early Lakes on a Plate programme included a sausage roll recipe, but with a twist: Peter Sidwell, a chef who is also the presenter, added home made Fennel & Apple Chutney. I was intrigued as this was a chutney I had not heard of before. Fennel has, of course, a mild aniseed flavour. The flavour can be found in flavoured alcoholic drinks such as the French Pastis, Greek Ouzo and other similar drinks, although these are usually made from distilled Star Anise, which is an asian spice unrelated to fennel. In the UK you can buy boiled hard sweets such as aniseed balls and aniseed cough candy or twist where the flavouring comes from oil of Aniseed, a border herb with an umbrella shaped flowerhead but also sometimes from Fennel seeds. Both seeds can also be used as part of a spice mixture or in cooked dishes and breads. This recipe uses Fennel, sometimes called Florence Fennel, a white bulb often topped with green feathery fronds, which can be sliced or finely chopped into savoury dishes, or baked and is often used in fish dishes, although not exclusively. (Find more recipes and mentions of Fennel on this site.) As I have mixed feelings about aniseed flavour (disliking the drink, but loving aniseed sweets and fennel in food) I decided to make just a half quantity of the recipe, but I wish now I had made more! 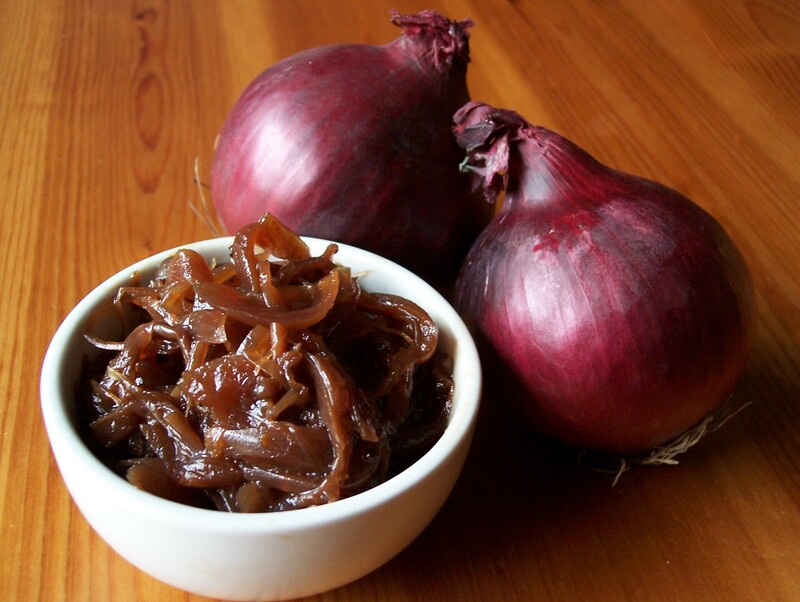 The flavour is delicate and sweet rather than overpowering and it is delicious and unusual spread on toast: a sort of Fennel & Apple Marmalade. I am still deciding how I might incorporate this chutney in recipes and other than the sausage rolls of the original recipe, what else it could be used in. I am not a great sausage roll fan, probably because when they appear on buffets they tend to be greasy apologies with fatty pastry and poor quality sausage. I think, however, that these sausage rolls containing fennel and apple chutney would be in a different league altogether. I fully intend to use this to make a Sausagemeat Plait in the very near future, just as soon as I have found and bought the good quality sausagement it deserves. The quantities of apple and onion are a little unclear in the original recipe: I used aproximately the same weight of each as the fennel bulb and I chose to finely chop rather than follow the original instruction to roughly chop them. I also used my usual method of adding the sugar later, once the vinegar has mostly gone, to lessen the risk of burning the chutney. This recipe does not make a large quantity, so watch out for when fennel is being sold off on your market at the end of the summer or early autumn and stock up. I find uncooked fennel bulbs, quartered, freeze reasonably well. 1. Finely chop the fennel and onion. Place in a medium sized heavy pan with a drizzle of olive oil. Cook on a medium heat until soft, making sure they do not start to brown. 2. Meanwhile peel, core and finely chop the apple. Add to the pan and continue to cook the mixture for a few more minutes. 3. Add the white wine vinegarand fennel seeds. Continue to cook for a further 20 minutes until the liquid has reduced by half and is thick. 4. Add the sugar and reduce until thick once more. Season with salt and pepper and leave to cool. Alternatively put the jars in an oven set to 180oC/350oF/Gas 4 for 10minutes. Be careful to put them on a dry surface when removing or they could crack. Lids can be placed in a small pan of boiling water. Shake as much water from the lids as possible before filling. 6. Pot into the prepared jars. Cool and label. 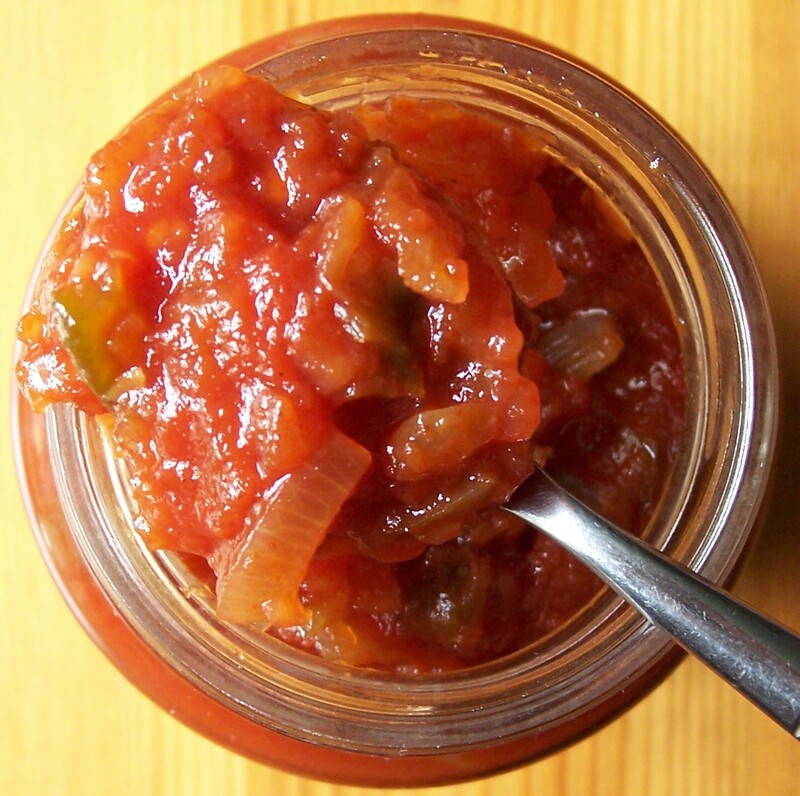 I find that chutneys are best stored for about four weeks to mature before eating. I recently bought some late rhubarb on our market, put it in the fridge and promptly forgot about it! A week or so later I discovered it in a rather floppy state and not really fit for stewing and eating in the usual way. In ancient times food that was past its best was disguised with spices so I turned to my recipe books and eventually found this chutney recipe. The acidity of the rhubarb along with the citrus sourness of the orange means that, in spite of the sugar, this is still rather a tart flavoured chutney and would go well with a rich or oily meat such as duck or pork, or possibly even with an oily fish such as mackerel (I once saw a recipe for mackerel with a rhubarb sauce). My only comment – one which I actually made out loud as I spooned this chutney into jars – is that this is yet another muddy coloured chutney. A commercially produced version would have some added food colouring to make it a pretty pinky-peach, I would imagine. 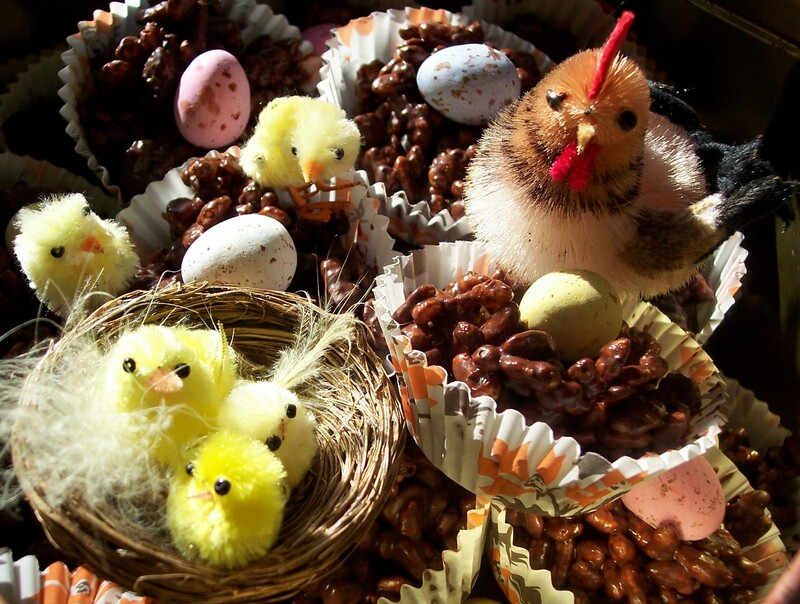 Colour aside, though, this is definitely worth making. The recipe comes from Home Preserves by Jackie Burrow which has been on my shelf for some years and contains a wealth of good recipes. I have slightly adapted the original recipe for Spiced Rhubarb & Orange Chutney: I was a little short of rhubarb to make a half quantity so I added some chopped apple and I used grated fresh (but frozen) ginger in place of ginger powder. I also zested the orange rather than peeling the zest off in larger chunks with a potato peeler (just the zest, but no pith). I have added these alternatives to the recipe below. My only other comment would be that the ginger could be slightly increased (although we do like a strong ginger flavour, so be careful). 1. Place the rhubarb and onion in a large saucepan, plus apple if using, along with the zest and juice, mixed spice, ginger, salt and vinegar. 2. Bring to the boil on a medium heat, then reduce the heat. Allow the mixture to slowly reduce, stirring regularly, until it is thick enough to leave a channel (that gradually disappears again) in the bottom of the pan when a spoon is drawn across. 3. Add the sugar and stir well. Cook on a medium heat to allow the chutney to reduce as quickly as possible without burning, stirring regularly to stop it from sticking to the bottom of the pan. When the channel can be drawn on the bottom of the pan once more it is ready to pot. 5. Pot into the prepared jars. Cool and label. Ideally, store for about four weeks to mature before eating. 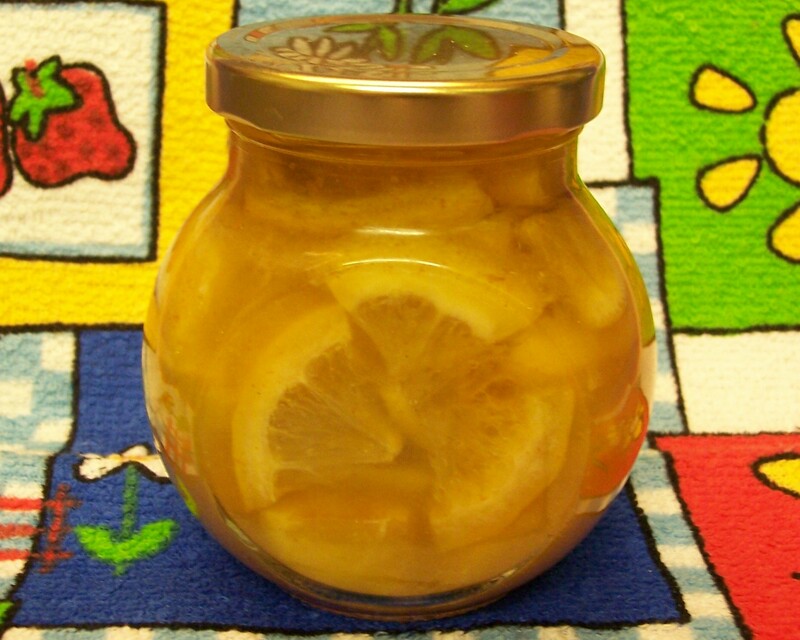 Pickled lemons are traditionally used in North African dishes. The sourness of lemon or lime and the saltiness of olives can be cooked together with meat or fish, often in a traditional Tagine, or served as an accompaniment at the meal. (I will be posting a delicious recipe for North African Spiced Baked Chicken with Pickled Lemon in the next week or so.) The pickle is delicious finely chopped and stirred into Couscous. The original recipe also suggests placing pieces on fish fillets before baking or using the lemon oil/vinegar as in dressings or on fish and chips for a spicy lemon flavour. I tried, unsuccessfully, to make pickled lemons some years ago and was loth to try it again, but I experimented with a very small quantity with a different recipe and this time found it to be extremely successful. 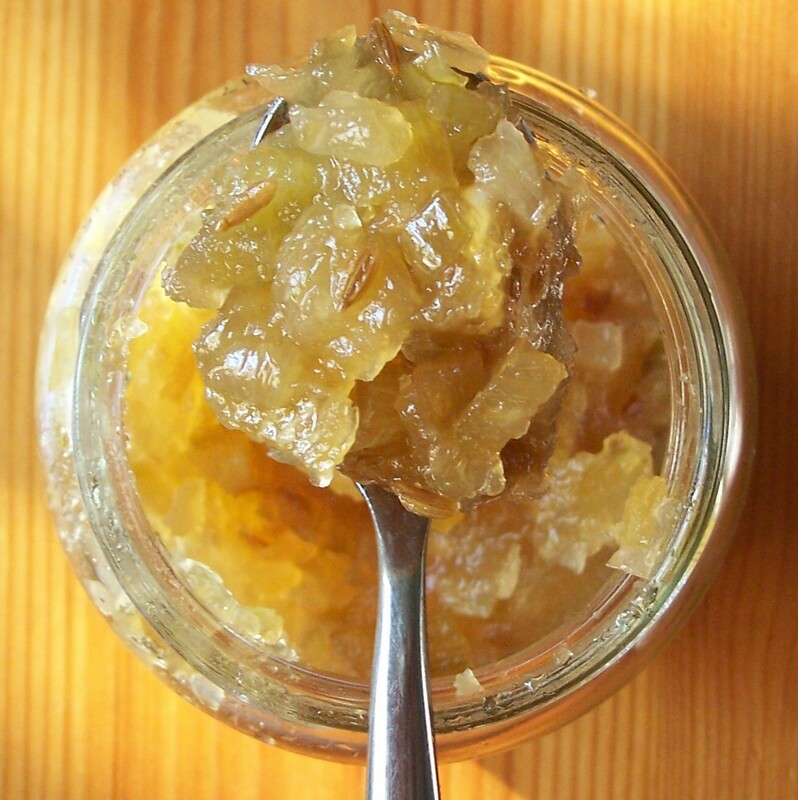 The lemon and/or lime pickle is very quick and simple to make and can be used after three or four days, although three weeks is recommended to allow the fruit to start to soften. 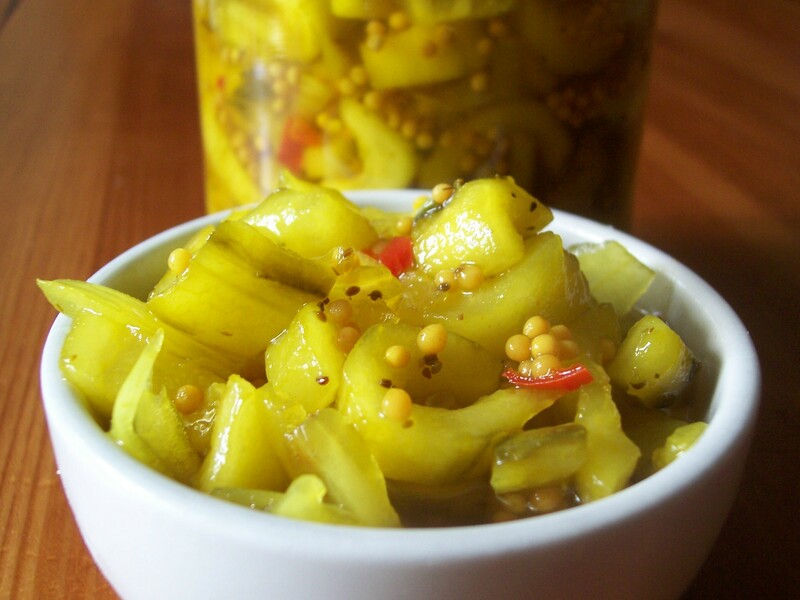 This recipe was taken Crosse & Blackwell/Sarsons Vinegar Perfect Pickles by Suzanne Janusz. (The recipe for Lime Pickle, a spicy accompaniment for Indian Food with a very different taste, was taken from the same booklet.) 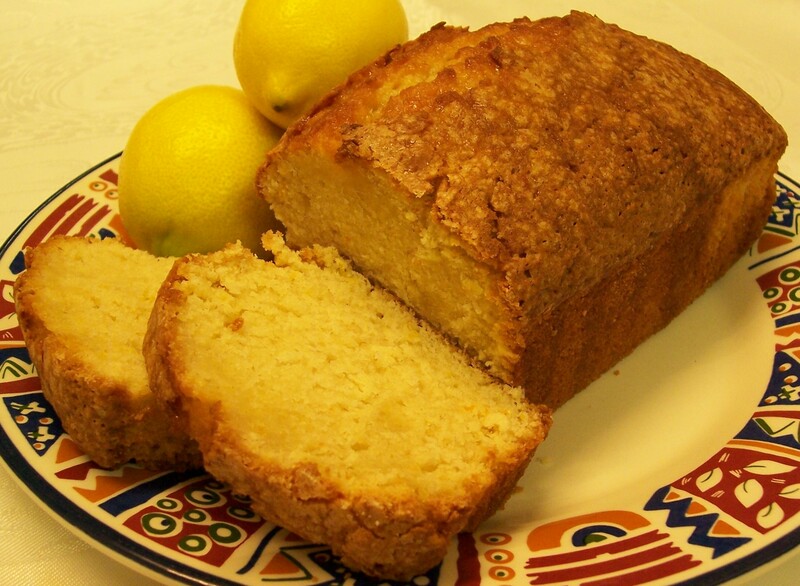 This recipe is for finely sliced lemons and limes but it can be made with lemons or limes alone and I have seen whole and halved lemons prepared in a similar way, although I have not tried this. I see no reason why larger pieces of fruit could not be used although they would probably need longer to absorb the pickling mixture. It is better to make several small sized pots as the lemons start to deteriorate, becoming over soft, once the pot has been opened. For this reason too it would be wise to reduce the ingredients, making a smaller amount, where the pickle is just for occasional use. This recipe needs to be started the day before. 1. Scrub and finely slice the lemons and/or limes. 2. Layer the fruits and salt in a non-metallic colander or sieve. Cover with a non-metallic cover (not touching the fruits) and leave in a cool place for 24hrs. 3. Before preparing the pickle wash and sterilise the jars. I usually do this by filling them with boiling water and putting the lids in a separate small bowl of boiling water. Pour away the water just before filling each jar and once the jar is full immediately take the lid from the bowl and without touching the inside screw it onto the jar. Although the contents for the jars in this recipe are not heated the hot lid should contract and form a seal: if re-using a jam jar with a ‘pop in/out indicator’ on top this may well contract. However, the seal cannot be guaranteed so it is best to make occasional small quantities rather than one large batch. 4. Do not rinse the fruit. Layer in sterilised jars sprinkling paprika between the layers. 6. The jar should regularly be gently shaken to mix together the oil and vinegar. Allow to mature for a few days and ideally up to three weeks before using. Store in a refrigerator once open.